Sedgwick County (standard abbreviation: SG) is a county located in the U.S. state of Kansas. The county's population was 498,365 for the 2010 census. 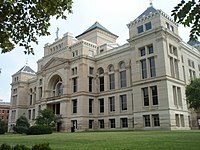 The largest city and county seat is Wichita. Sedgwick County is part of the Wichita metropolitan area. Sedgwick County was founded in 1867, and named after John Sedgwick, who was a Major General in the Union Army during the American Civil War. Sedgwick County was the setting for the murders committed by the BTK strangler from 1974 until 1991. Dennis Rader, an employee of the Sedgwick County city of Park City was arrested in early 2005 after he began sending incriminating letters taunting the police in 2004. He had not been heard from since 1979. Ken Landwehr of the Wichita Police Department led the task force which captured Rader, setting a new standard of serial crime detection in the process, which is still studied by police departments across the world. Rader is currently serving 10 life sentences at the El Dorado Correctional Facility in El Dorado. Sedgwick County was a prohibition, or "dry", county until the Kansas Constitution was amended in 1986 and voters approved the sale of alcoholic liquor by the individual drink with a 30% food sales requirement. The food sales requirement was removed with voter approval in 1988. According to the 2000 census, the county has a total area of 1,009.41 square miles (2,614.4 km2), of which 999.38 square miles (2,588.4 km2) (or 99.01%) is land and 10.03 square miles (26.0 km2) (or 0.99%) is water. As of the census of 2000, there were 452,869 people, 176,444 households, and 117,688 families residing in the county. The population density was 453 people per square mile (175/km²). There were 191,133 housing units at an average density of 191 per square mile (74/km²). The racial makeup of the county was 79.38% White, 9.13% Black or African American, 1.11% Native American, 3.34% Asian, 0.06% Pacific Islander, 4.17% from other races, and 2.81% from two or more races. 8.04% of the population were Hispanic or Latino of any race. There were 176,444 households out of which 34.40% had children under the age of 18 living with them, 51.70% were married couples living together, 10.90% had a female householder with no husband present, and 33.30% were non-families. 28.20% of all households were made up of individuals and 8.70% had someone living alone who was 65 years of age or older. The average household size was 2.53 and the average family size was 3.14. In the county the population was spread out with 28.20% under the age of 18, 9.50% from 18 to 24, 30.30% from 25 to 44, 20.60% from 45 to 64, and 11.40% who were 65 years of age or older. The median age was 34 years. For every 100 females there were 97.80 males. For every 100 females age 18 and over, there were 95.20 males. The median income for a household in the county was $42,485, and the median income for a family was $51,645. Males had a median income of $37,770 versus $26,153 for females. The per capita income for the county was $20,907. About 7.00% of families and 9.50% of the population were below the poverty line, including 11.90% of those under age 18 and 7.00% of those age 65 or over. Sedgwick County is divided into twenty-seven townships. The cities of Bel Aire and Wichita are considered governmentally independent and are excluded from the census figures for the townships. In the following table, the population center is the largest city (or cities) included in that township's population total, if it is of a significant size. This page uses content from the English language Wikipedia. The original content was at Sedgwick County, Kansas. The list of authors can be seen in the page history. As with this Familypedia wiki, the content of Wikipedia is available under the Creative Commons License.